In every profession and in every business, you always start out as a nobody before gaining popularity. To become a somebody, you will need to make yourself and your business known to the public through advertising and making use of flyers, brochures, or posters. You can also make yourself recognized by using business cards, which is the most formal tool that businessmen use to be able to share their contact information with prospects or with other business people. 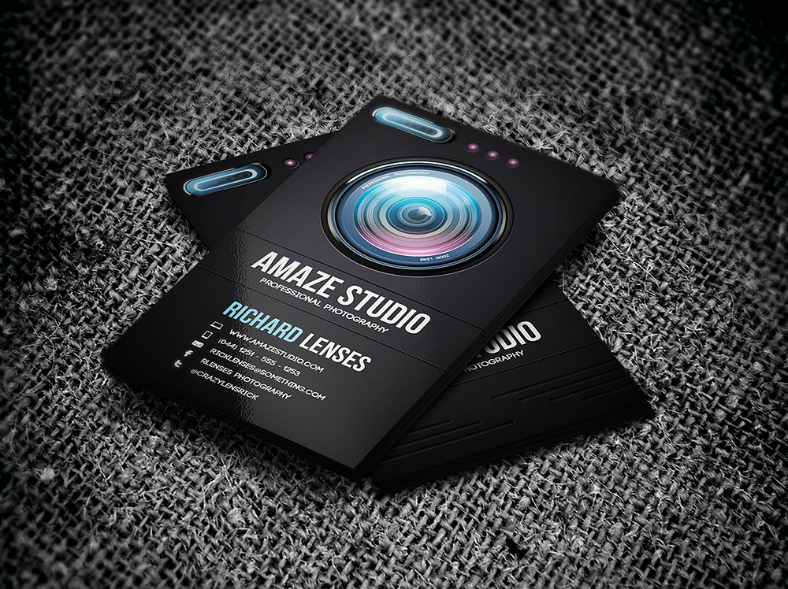 On this page, we have gathered various unique business card designs for photographers. These designs range from minimalist ones that contain text only, to those that maximize the use of graphics. We also have business card designs that utilize the colors black and white alone, and we also have those that have almost all shades. 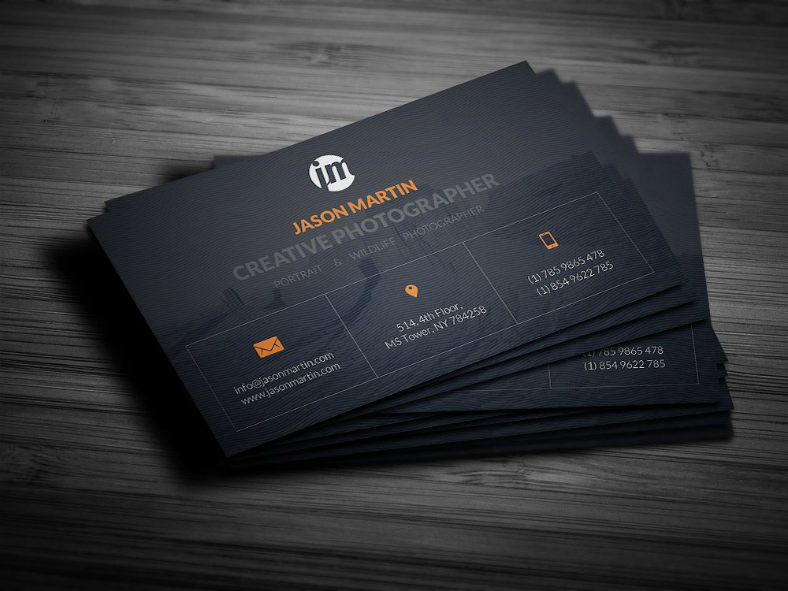 If you’re a photographer in need of your own business card, feel free to check out the designs that we are offering. 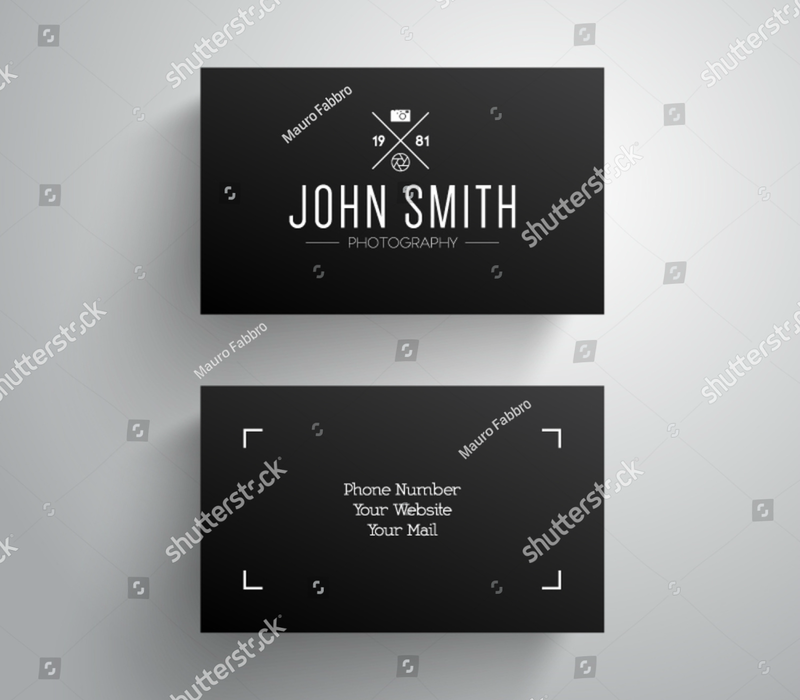 Download this business card design if you wish to have a simple and professional look on your business card. The color scheme of this design maximizes the use of the color white with the front side entirely in black and white only. The back side of the business card is where you can find other colors being used, but are only limited to a single strip running from the left side of the middle area of the card to the right. It is also on the back side of the card where you may be able to write down your contact details and your online portfolio’s web address. If you choose not to include a picture of yourself on your business card, then this design is perfect for you since this only uses vector images on the card. 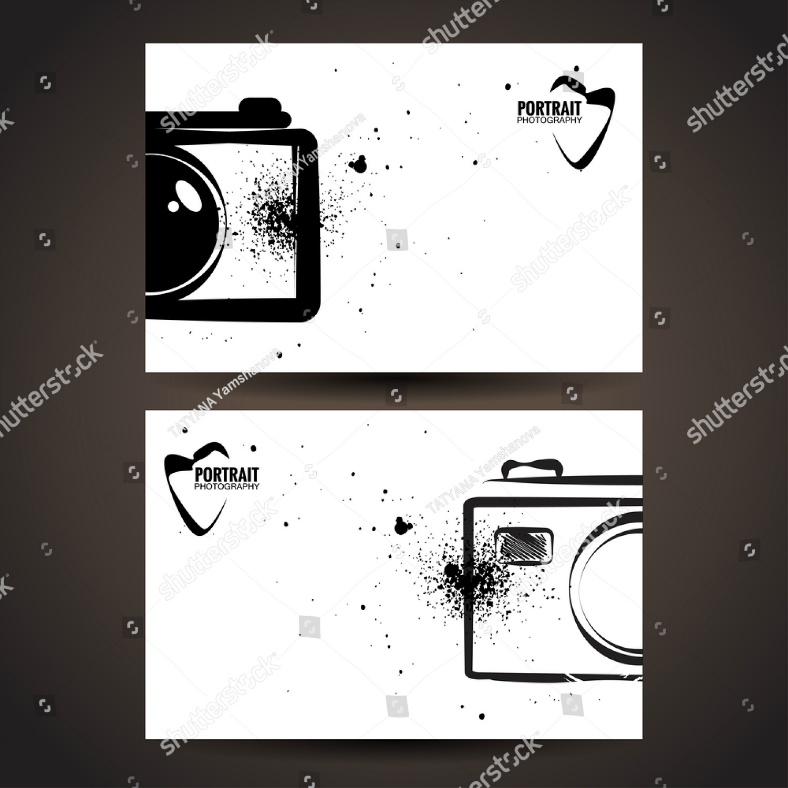 On the front side, you can see a black textured background with an image of a camera over it, but this image can be replaced with your own personal logo if you wish. Below that image, you will then need to indicate the name of your company and your slogan, if you have one. On the back is where it gets creative since this is where the name of the photographer and all contact details can be found. For a business card that is both simple to design, easy to understand, but is still professional-looking, then the one above may be what you are looking for. 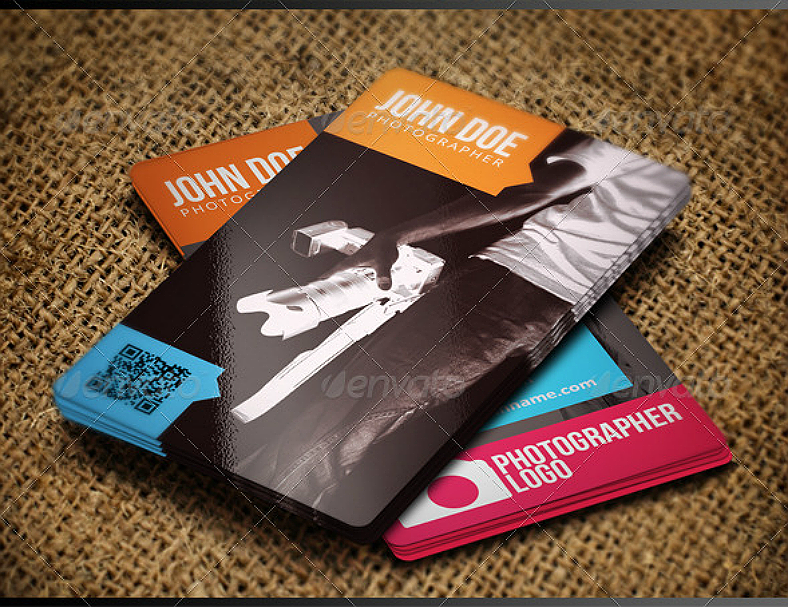 This business card mockup design places its emphasis on the written details and not so much on the graphic images. If you look closely at the background, you can see that it is actually a scenery photo, which only proves that the graphics here are only second priority and are only used for decorative purposes. For a more modernized feel to this design, there is a QR code at the back side of the card, which can be used to redirect a prospect to the card owner’s online portfolio once they scan the code. 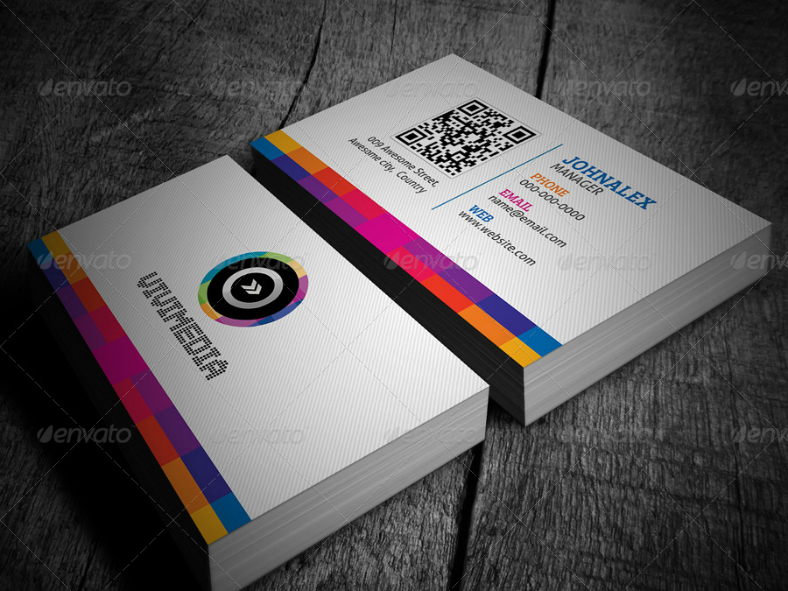 Promote your photography business with this amazingly colorful business card design, and you’ll be sure to get the recognition you need. While there aren’t much graphics on this image, which is actually a good thing, the most prominent feature on this design that can effectively capture the attention from people are its colors. While the use of white space is maximized on this design, both front and back sides also make use of a lot of colors to increase this design’s level of appeal. As you can see on the image above, the back side of this business card also contains a QR code, and many business experts today would recommend including one on your card to provide the prospect with supplemental information that are not found on the business card. Check out the business card design above, you would most probably agree with us when we say that there’s nothing more simpler than how it already is. 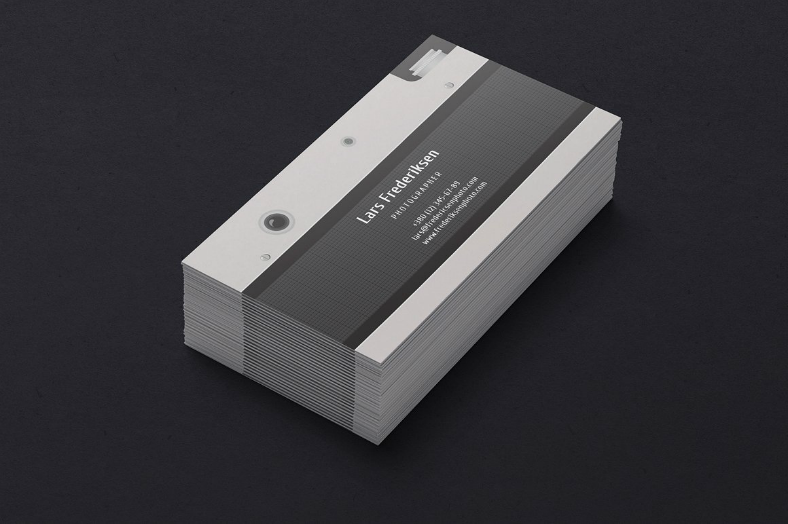 Both sides of the business card make use of only two colors, which are black and white, but according to experts, this color scheme is called achromatic. On the front side of the business card, you can write your name and you profession, and you can also choose to incorporate your own logo on the design. As for the back side, you only need to write down your most important contact details which include your phone number, website or social media page, and your street or mailing address. 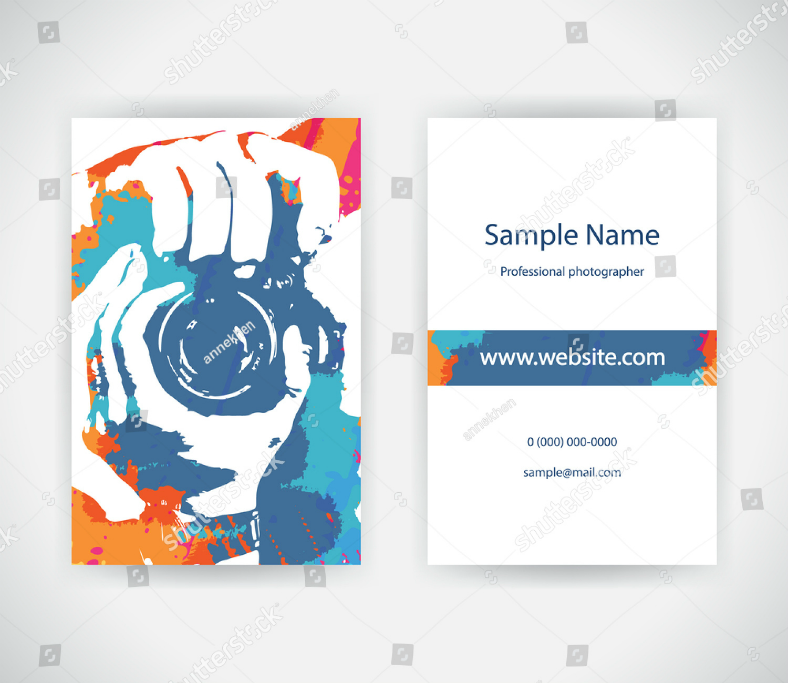 Download this awesome business card design if you wish to make use of a vertically-oriented business card to promote your profession. A space is provided on the front page where you can add a photo of yourself, and you also add some creativity to your photo by making it look mosaic-inspired. If you have your own logo for your business, you may add this logo on the bottom part of your card, but if not, you may simply indicate the name of your company on this space. For the back side, the cardholder’s name can be found on the upper portion of the card, and all other information including the contact details can be found compressed inside a line art of a camera, with a small QR code beside it. This business card will be impossible to miss simply because of how bright it appears. Place this in a pile of business cards, and this one will surely stand out. While this design is fully editable and you are allowed to change the colors on the background, but why would you? The reason behind the bright colors is for it to get noticed easily. 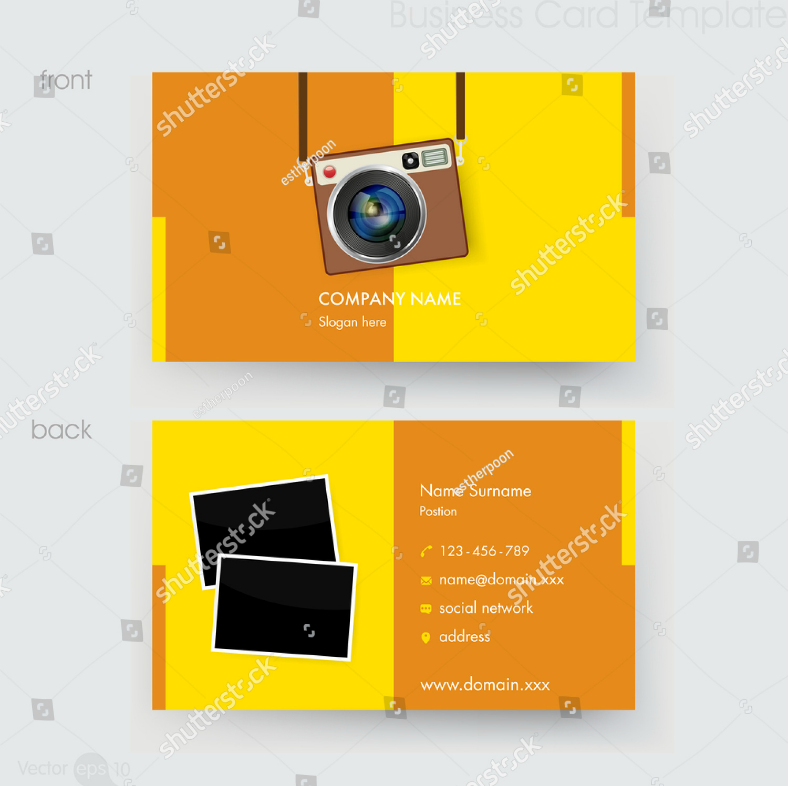 Add a couple of enhancements to the business card such as an image of an old school camera on the front side, and a few sample images on the back along with the contact details that you need to write down. Since you are working as a photographer, then why not make your business card appear appropriate to what you actually do? 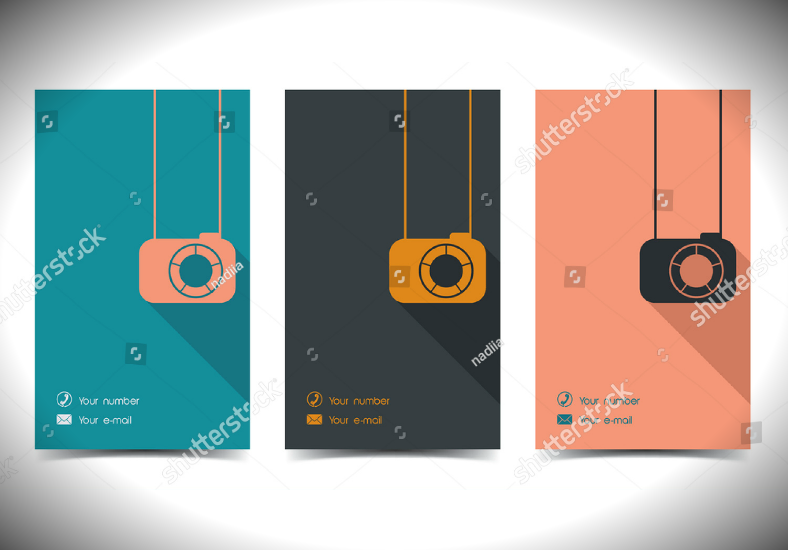 While the use of point-and-shoot cameras have decreased over the recent years with the growing popularity of camera phones, choosing this design will most likely make your business card appear unique and will stand out from among a pile of other business cards. On the front side of the card, the entire left half can be used to write down your name and your profession. On the back side, you can make use of the LCD area to include a portrait photo of yourself and then set a space beside it to write down your contact details. If you want a minimalist but colorful business card design, then you might find this one perfect for you. Unlike the previous achromatic minimalist design we have shown you, this one actually uses colors. You can choose between three preset color schemes: blue and pink, gray and orange, and pink and black. 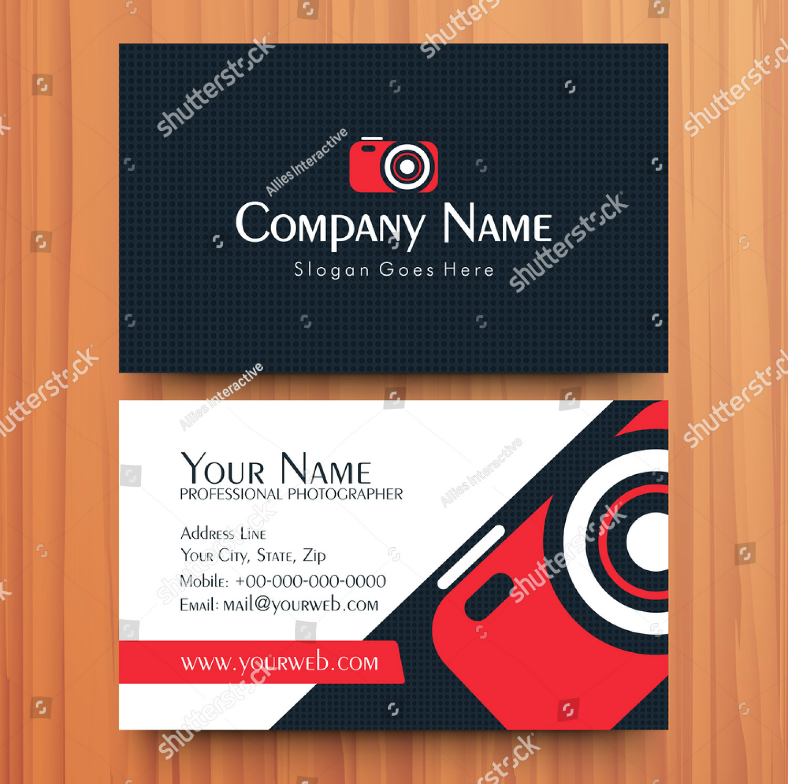 On this business card design, though, you only need to indicate your name and your contact number on the bottom-left corner of the design, which leaves the rest of the card blank and clean. 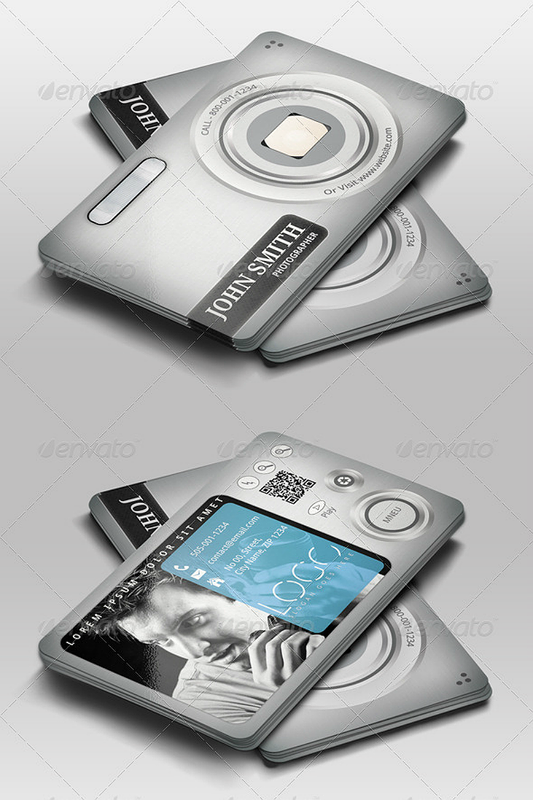 Even with this pre-designed business card mockup, you may still be able to add more elements on it as you desire. You may want to put some additional icons or images, or even some text to fill-in to those blank spaces on the card, just make sure not to overdo it to prevent the design from looking disorganized. While most business cards are in a horizontal orientation, this one is different because it is done vertically. The front and the back side of this business card design look similar with the only difference being the contact details and the logo on the bottom area of the back side in place of the QR code that is on the front. 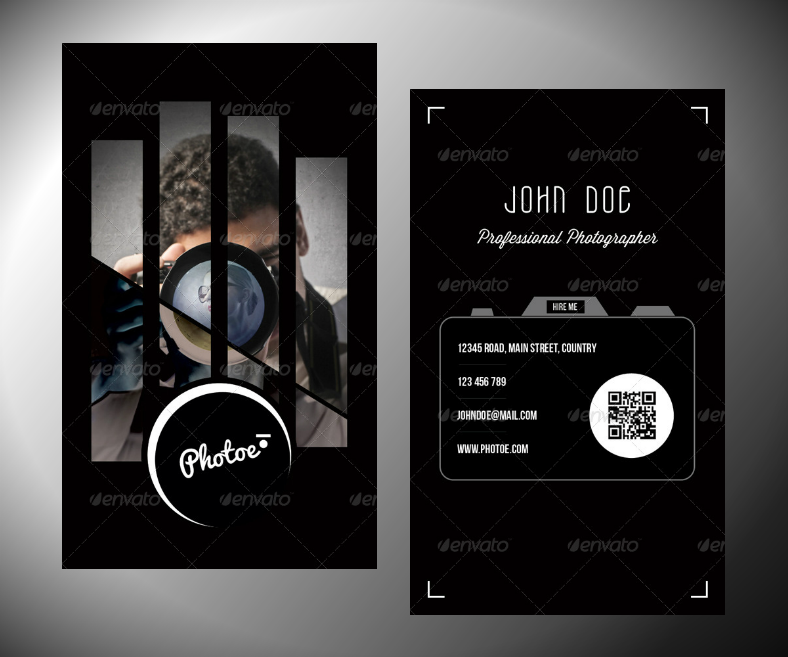 The backdrop of this business card design can be changed depending on your preference, you may use a portrait photo of yourself or you may stick to the style shown on the sample above, which only shows the photographer holding a camera. Download this design if you want a combination of a monochrome image, an image with an inverted color scheme, and some decorative colors on the sides. Photographers back then made use of film cameras that took raw but excellent pictures which also relied on how well they are able to compose a shot. Unlike today’s digital cameras that use memory cards to store the images, the cameras back then used films which doesn’t allow you to delete those shots that weren’t properly taken. This means that every shot had to be perfect to avoid wasting precious exposures on the film. This required exceptional talent on the part of the photographer. In honor of the cameras of the past, here is a vintage business card that is designed to resemble those vintage cameras. Only on the back side of the card will you be able to write the information you need, such as you name and your contact details, so make sure to write down only those that are highly relevant. We know what you are about to say. “Wow! 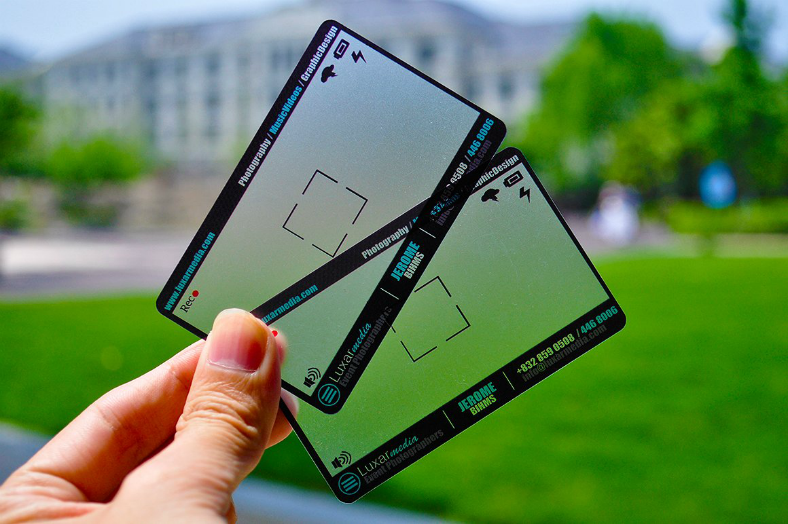 A transparent business card!” We can totally relate to that reaction because that is exactly how we reacted upon seeing this business card design for the first time. All the relevant information about the cardholder are compressed along the edges where it isn’t transparent, and leaves the middle area empty aside from all the icons to make it look like a real camera viewfinder LCD. We are sure that if you have a copy of this business card, you will be tempted to play around with it as if it was an actual camera. To make this business card work, make sure to buy yourself a hard, clear plastic that can be used for printing, or to save you the hassle, you can always have printing companies take care of it for you. Download this transparent business card design for a very creative approach to exchanging contact details to other people. Here’s another business card design that uses a vertical orientation. The front side of this business card is used solely for artistic and creative effects, and the image of a photographer looking down on a camera is done via paint splashes, which is a common technique among abstract artists. This paint splashed image takes up the entire front side which leaves you with only the back side to write down your name, your website address, and your contact details. Download this design if you wish to use a business card that balances color with the amount of white space used. From the title itself, this business card design will surely amaze those who could get their hands on these. While the appearance of this business card is unrealistic, you can also say that the design us unconventional and creative in its own way. The front side of the camera simply shows us the lens of the camera which occupies more than the upper half of the card, and the name of the business is shown written on the bottom half. On the back side of the business card, the lens is still present but is smaller in size to allow you to occupy the bottom area of the card with all the necessary contact details and your complete name. Lastly, this business card uses only the colors black and white, and the images on this design are done in linear art alone. The images are only found on the sides of the design, which in fact, occupy less than half of the entire card leaving you with a lot of blank space to write down everything that you need to be able to share your business and contact information to others. Unlike the previous business cards that have already included the typography, this one gives you more freedom on what typography to use and where you want to place it. This business card design encourages you to maximize the use of your creativity. 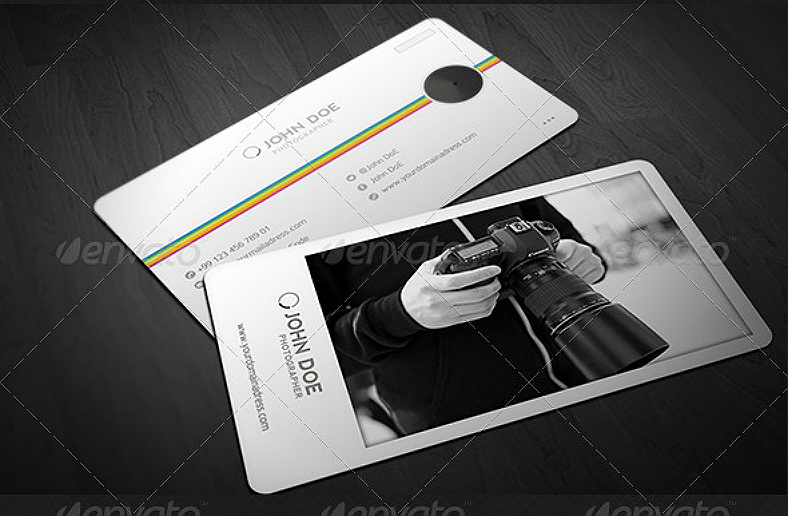 Therefore, if you want full control over the design of your business card, then download this one. As you have noticed, the business card designs that we have shown you are exceptional and are different from one another, and this is because we had to carefully select only the best ones from among hundreds of business card designs that we came across with. These business card designs can be downloaded easily and for a very reasonable fee. As long as you have an internet connection stable enough for downloading, simply click on the red buy/download button, pay the necessary fee, and the design can be all yours. As for the quality of these business card designs and their level of editability, you may say that you have a win-win situation. These files are in vector format, which allows you to fully edit these business cards and even individualize each element if you wish to edit only specific areas on the design without altering the rest of it. With vectors, you can also freely resize elements on the design without having to worry about it getting pixelated, and this is because vectors are made up of paths and codes as opposed to raster graphics that are made up of pixel blocks. So what are you waiting for? Get yourself busy and download your own business card now.